In 2015, 1,340 accidents were recorded in visakhapatnam, out of which 350 were fatal. 41% of these accidents involved two-wheelers. The alarming number of accidents in just one city highlights the importance of having insurance on your vehicle and on your life. Under the Motor Vehicles Act, 1988, it is mandatory to have at least a third-party liability policy for any two-wheeler. To ensure that at least third-party expenses were covered in case of accidents, the government introduced this rule as the Indian roads started to bear more traffic. There are a number of insurance providers offering adequate coverage at affordable premiums in Visakhapatnam. 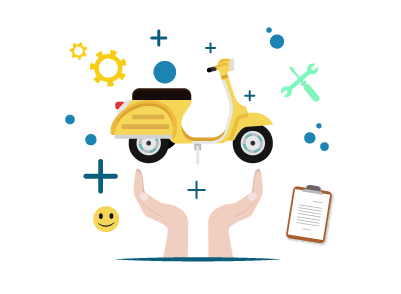 The best two-wheeler insurance policy in Visakhapatnam is relative to your requirements, the coverage you want and the premium you are willing to pay. With a plethora of options available from different insurers, it can be hard choosing your ideal insurance provider. Some of the popular insurance companies in Visakhapatnam that offer motor insurance for two-wheelers have been listed below. You should have a list of partner garages across the country mentioned in your welcome kit or insurance policy document. When you opt to use the services of a cashless garage, the most important benefit is that the paperwork is handled by the garage. The bill is settled directly by the insurer. The customer has a very small role to play in this process therefore reducing the time taken and the hassle involved. Apart from this, customers can benefit from a number of other features of cashless garages in Visakhapatnam. Fast approvals and settlement - Getting approvals on cashless claims are usually done within 24 to 48 hours. The settlement of the bill is handled between the insurance provider and the garage. The customer is not required to collect and submit documentation and wait for a reimbursement. Out-of-pocket costs - The customer will be required to pay only what the insurance plan does not cover. Once the claim has been approved, the insurer will pay what is due to the garage. Premium Costs - To purchase the plan, one must pay a premium amount. You need to look at your options of premium amounts, premium payment frequencies and terms. Generally, for a two-wheeler policy, you will be required to pay a single premium for an annual policy term. Coverage Options - With two-wheeler insurance, there are two options available: liability-only policy or a comprehensive package. With a third-party liability policy, only damages, injury and death caused to a third party will be covered. If you choose a comprehensive package, then you will also be covered for own damages. Cashless claims - Cashless settlements have a number of benefits in comparison to reimbursement claims. If your insurance provider offers cashless settlements, you will not be required to pay from your own pocket for the repairs. Cashless claims settlements save a lot of time, reduce the hassle and own expenses. Limits on claims - Insurance providers will pay only a certain limit in damages and liabilities. For death caused to a third party, there is usually no limit. For claims on damage to third-party property, the insurance amount is capped at Rs.1 lakh. When it comes to comprehensive policies, the limits will depend on the premium paid, the sum assured and the coverage opted for. When you sell your bike, you need to adhere to a certain procedure to make sure that in the future, you will not be connected to any liabilities that may arise. To do so, you need to transfer the ownership name of the vehicle to the new owner. You need to visit the Regional Transport Authority (RTO) and inform them of the sale of the vehicle. You can then apply for a No Objection Certificate (NOC). They will make the transfer. Place a request to transfer the policy on the vehicle to the new owner. Transferring insurance policies reduces the hassle for the new owner, eliminates the need to close your policy, plus you get to retain your no-claim bonus.